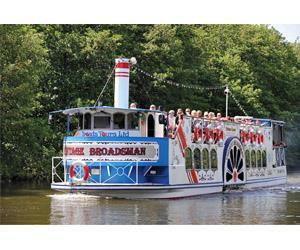 If you don’t have any children but still want to get into the Christmas Spirit, why not board the Queen of the Broads for a Festive Cruise! As we depart from Wroxham the Crew will come around with a warming glass of mulled wine and a mince pie for everyone on board; while the Skipper will give a live commentary explaining the origins of the Broads and pointing out any points of interest and the local wildlife. On the way back to Wroxham sit back and relax with Christmas music. What better way to start your festive celebrations?